Ariel Herwitz & Devin Farrand, Southwest Drive, Los Angeles, 2016. Image courtesy of the author. During a recent trip to Los Angeles, I visited the Hyde Park studios of Devin Farrand and Ariel Herwitz. Gathered at the kitchen table in their renovated warehouse on Southwest Drive, we talked about their practice and the evolution of the LA art scene since their arrival in 2011. Both artists have solo exhibitions opening in the city this fall (at Ibid Gallery and Ochi Projects, respectively), each revealing a distinctive sense of gravity. This natural force—one causing things to move towards each other—also befits the synergy of these two artists on the rise. Farrand and Herwitz met while in graduate school at Cranbrook Academy of Art. Both were in the Ceramics department, studying under Danish artist Anders Ruhwald and embracing the interdisciplinary approach of the Academy’s studio-based program. Taking a welcome break from the bitter Michigan winter during their second year, the department traveled to Los Angeles for a series of gallery and studio visits. It was the first trip to LA for both—he grew up in Oregon and she in Massachusetts—and Farrand “was sold on the lifestyle immediately.”1 Neither hesitates to mention the weather nor the fact that they were wearing flip-flops and shorts in January. Most importantly though, both were inspired by what was possible in terms of space. Visiting artists such as Mindy Shapero, Amanda Ross-Ho and Erik Frydenborg illustrated what was possible with enough distance. The trip would prove to be a good primer for the couple and ultimately, the catalyst for a west coast move after graduating that spring. Installation View, Ariel Herwitz: A Crack, A River, A Chasm, A Sliver, Ochi Projects, 2016. Image courtesy of the artist and Ochi Projects. After securing a very part-time position (“maybe a day or two a week”) as a studio assistant, Farrand hit the road with a U-Haul. Putting everything into storage once he arrived in the city, he started working and sleeping in the back of his Honda Element, essentially living in the studio’s Culver City parking lot while he looked for spaces and learned to surf. It sounds romantic, more likely so in retrospect. Meanwhile, Herwitz spent the summer working in Boston, coming out to join Farrand after he secured a live/work space in Koreatown. The driving culture and the financial struggle hit her hard, but she also took solace in the landscape: “Devin would remind me to just get out and go to the beach. I’d drive to Malibu, watch the sunset and think, ‘ok – everything is ok.'” Soon, Herwitz would also land a position assisting a sculptor and both settled into their new rhythm of work and studio. Fast-forward five years. Looking back, the couple recognizes how difficult it was at first to break into the LA art scene. The big art schools (CalArts, UCLA, USC) were tightly knit and relatively separate in terms of community, and they had not yet discovered many artist-run spaces—though Herwitz also recognizes that “maybe we just weren’t aware of what was happening on that level.” Farrand added, “We’re definitely a support team. When we moved here, we didn’t know many people. We would go to all of the openings but would mostly just talk to each other.” But the timing of their move would prove to be serendipitous in terms of changes on the near horizon, as both artists grew with a new wave of galleries and the shifting epicenter of a burgeoning scene. Installation View, Devin Farrand: Heft, Ibid Gallery, 2016. Image courtesy of the artist and Ibid Gallery. 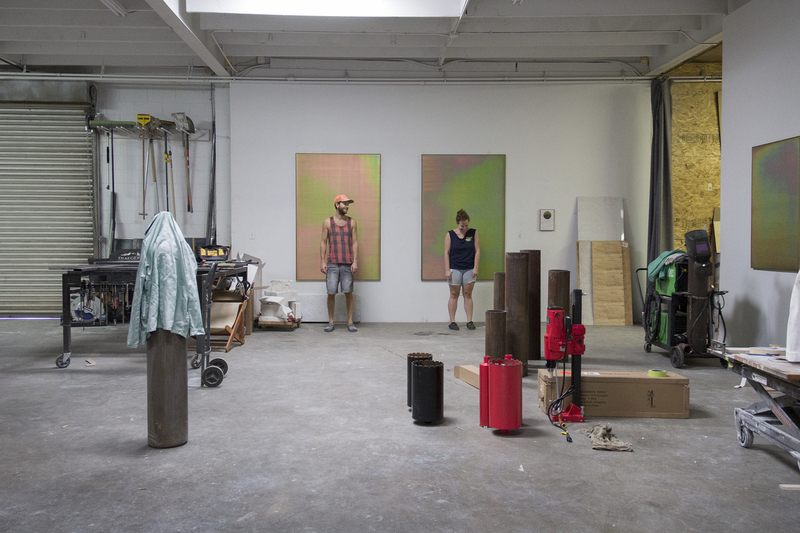 In the past year, both Herwitz and Farrand have left their positions assisting other artists in order to focus more intensely on their own studio practice. Such a shift was precipitated by the move from Koreatown to their current space in Hyde Park, an expansive warehouse space in need of major renovations. It was a leap, but they took on extra work building crates and frames to make the space pay off—while also attacking the renovations themselves. As Herwitz explained, “We couldn’t afford the space without the extra work, and we couldn’t do the extra work without the space… and we wanted to project how serious we were about our own work.” Amidst building walls and knocking out skylights, they were also planning a wedding—the couple married the summer of 2015. Devin Farrand’s studio, Los Angeles, 2016. Image courtesy of the author. Ariel Herwitz’s studio, Los Angeles, 2016. Image courtesy of the author. An element that runs strong in both of their work is a sense of materiality—a strength and shared language they attribute to studying at Cranbrook and the program’s strong connection to material. Farrand, exploring the intersection of manufacturing processes and the discovery of “crazy beautiful” Carrara marble, abstracts and streamlines in his own investigation of space and weight. Herwitz embraces the unique and, at times, unruly qualities of fibers and ceramics in works that reference our relationship to the body with their own latent energy. Whereas Farrand creates a sense of gravity by way of carving and welding, Herwitz harnesses it with her movement of structure and material. Beyond their studio practice, the metaphor of such forces can also be applied to their trajectory of living and working together in Los Angeles. I admittedly take the liberties of a romantic here as I consider the elemental pull of the two drawn together and what attracts them to a place. In any case, gravity is what gives us weight. 1. All quotes, unless otherwise stated, are from a conversation with the author in the artists’ Los Angeles studio on September 12, 2016. Heft, a solo exhibition of Devin Farrand’s work, opened on September 25 and is currently on view at Ibid Gallery’s new location in Downtown LA. His work will also be featured in an upcoming group show at BBQLA. A Crack, A River, A Chasm, A Sliver, a solo exhibition of Ariel Herwitz’s work, will be on view at Ochi Projects October 13-November 6. The artist will also be in residence at Bennington College in Vermont for the month of November, with a culminating show tentatively slated for November 29th.